Breaking a part of your body is never a good thing, but its especially bad timing when you’re in the middle of the Amazon jungle in Peru! 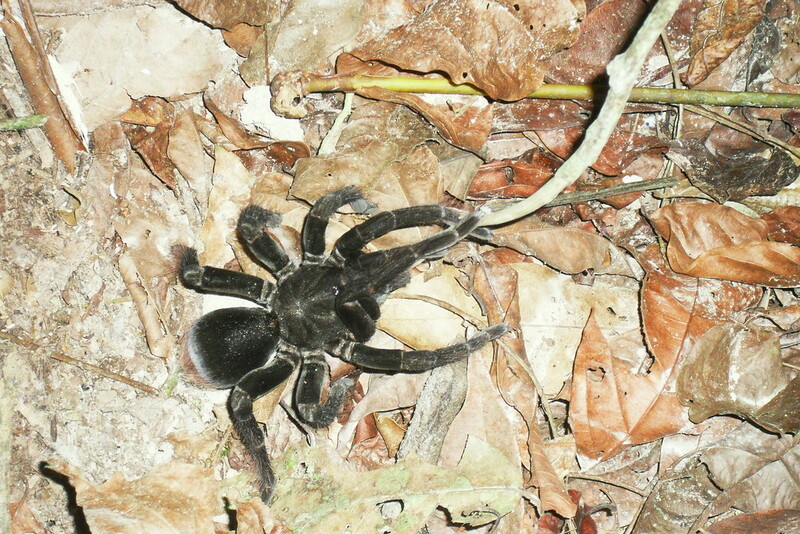 Luckily as I was to find out, help was on hand from a real life, local shaman! 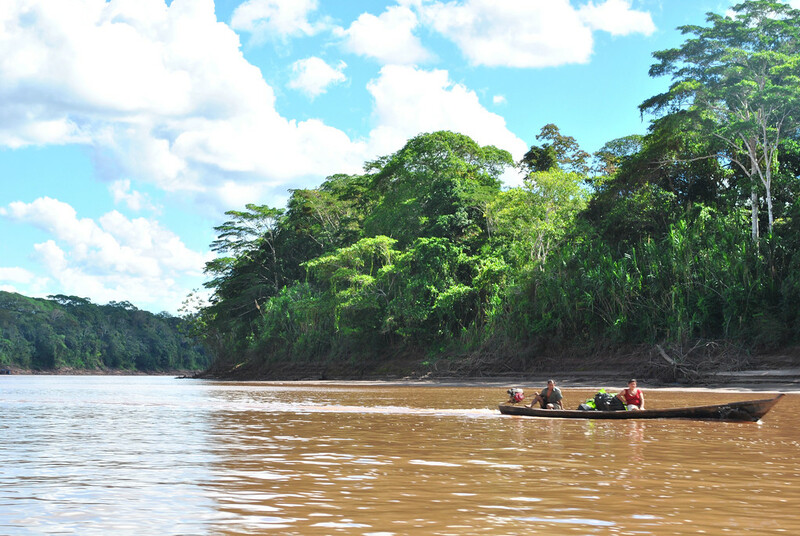 We had just travelled from Cusco to Puerto Maldonado in the Amazon Jungle, when my knee began to flare up again. I’d damaged it on the second day of the Inca Trail as we trekked down from Dead Woman’s Pass. It’s an almost constant downward trek for a couple of hours, and clearly my walking technique left a lot to be desired! 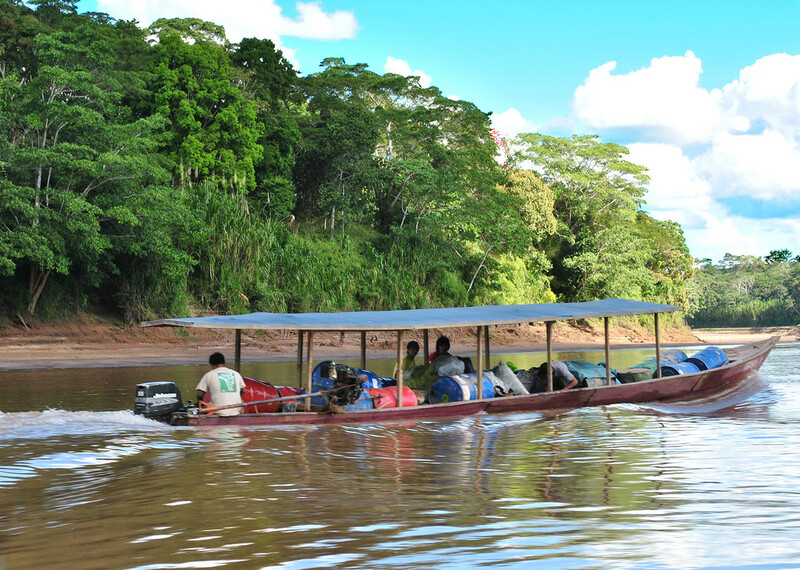 It was the beginning of something we had always want to do; visit and explore the Amazon in Peru! And here we were, landed and ready for action. Well, when I say landed, I mean landed at the second attempt. With a pretty short runway to hit, and jungle everywhere else, our pilot decided to pull out of the landing at the last moment to climb, circle and attempt again. 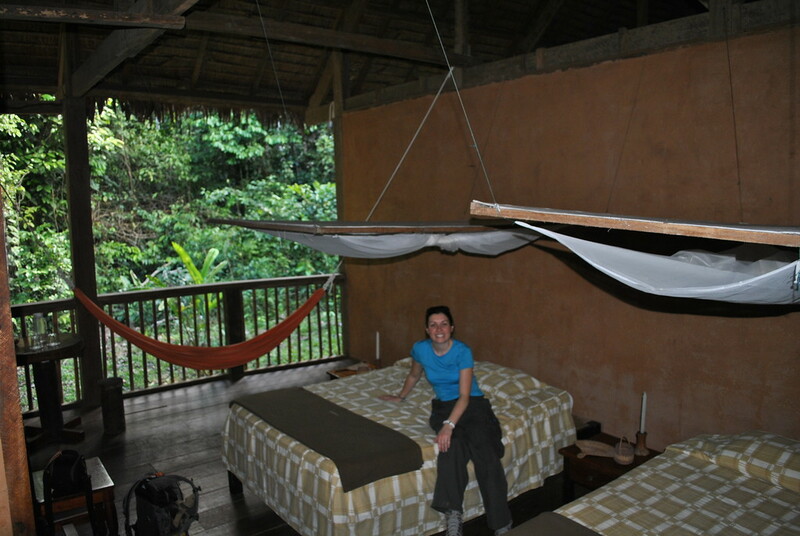 Not the best start to our amazon jungle experience, but I suppose it could’ve been worse! 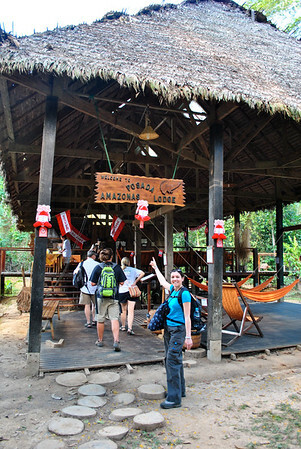 For the duration of our adventure in the Amazon, we were staying at a science research station called the Posada Amazonas Lodge, a Tambopata Research Centre. To get there we first had a to take a two hour bus journey from the airport to reach the river, where we boarded our boat for the forty five minute ride up river to our lodge. Cruising along the river meant we got to see all sorts of wildlife, but what fascinated me the most were the other humans zooming about on overly ladden boats full of petrol and food, some seemingly redefining the laws of physics as they came perilously close to an early (piranha infested) bath. After disembarking the boat, it was only a short walk to the lodge and our home for the next three days. We were really impressed with the lodge, it was basic but also very comfortable. What struck us immediately was how open the rooms and buildings were to the elements (and animals!). 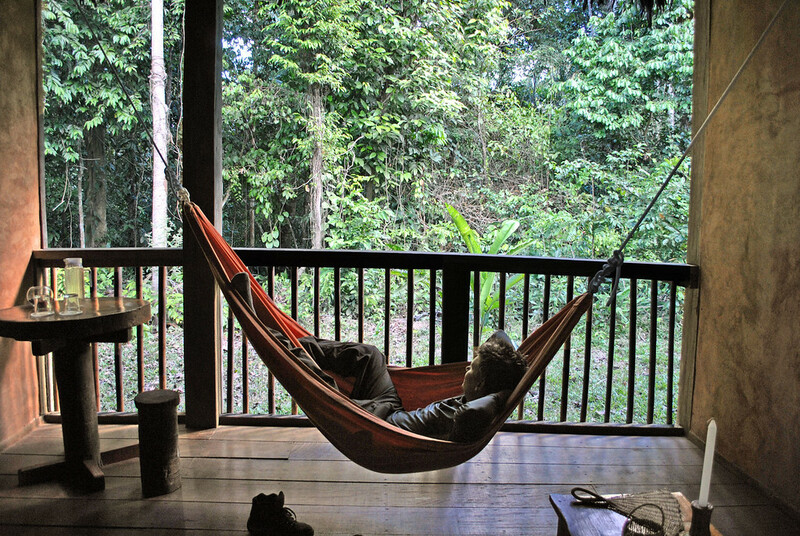 Our bedroom had three walls; replacing the fourth wall was an open vista looking out into the jungle, howler monkeys, spiders et al! Whilst initially surprised by this, we absolutely loved waking up in the morning as the sun rose as the howler monkeys stretched their vocal chords. We can confirm those monkeys really do live up to their name! The lodge itself is well equipped, by no means luxurious but we were incredibly impressed with the quality of the building, food and service. It even has a bar which got us very excited after a week of trekking and camping! As usual, anywhere that provides hammocks gets the thumbs up from us, so you can imagine our reaction after finding one in our room! 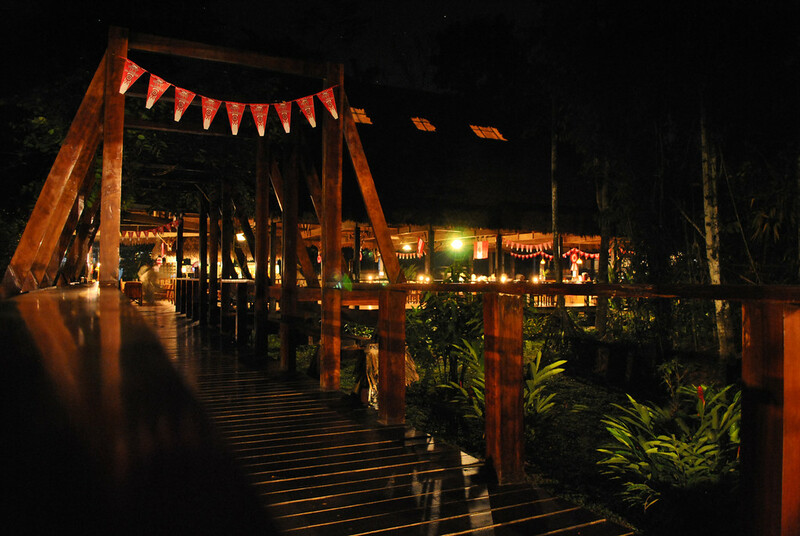 The food at Posada Amazonas was great (and there was plenty of it) and the staff were eager to please. As a research station, we were also offered lectures on the history of the area, the fauna and animals local to the lodge and surrounding areas. Normally this is something we’d love, but unfortunately this came at a time when we were both exhausted, so we only just managed to concentrate through it. The lodge offered a number of excursions: fishing, wildlife watching, a canopy view, a spider walk and a visit to a local tribe. The latter turning out to be very useful for me and my dodgy knee. Our fishing trip was eventful, especially as we weren’t fishing for the usual suspects. Oh no, we were going after Piranhas! Yes those little sharp bundles of energy made famous by the movies. So we cast our fishing rods into the water, and waited. Fishing for Piranhas is a little different to normal fishing (well mostly the same but with more fear). 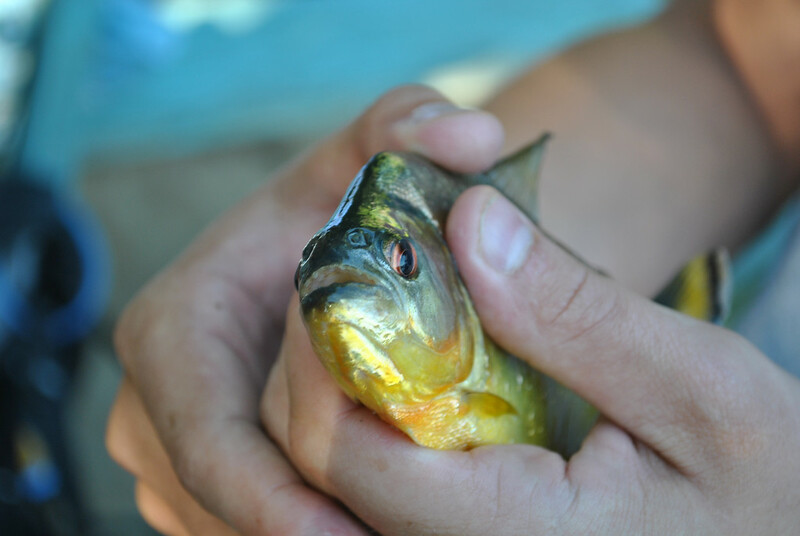 After around half an hour of fishing, we finally got our Piranha. They get bad press, and from what we saw of them they are mean little guys! That mouth doesn’t look too dangerous, but trust us it devoured everything we put in front of it in seconds. Luckily for us no-one fell in, and we all made it back with all our fingers intact. 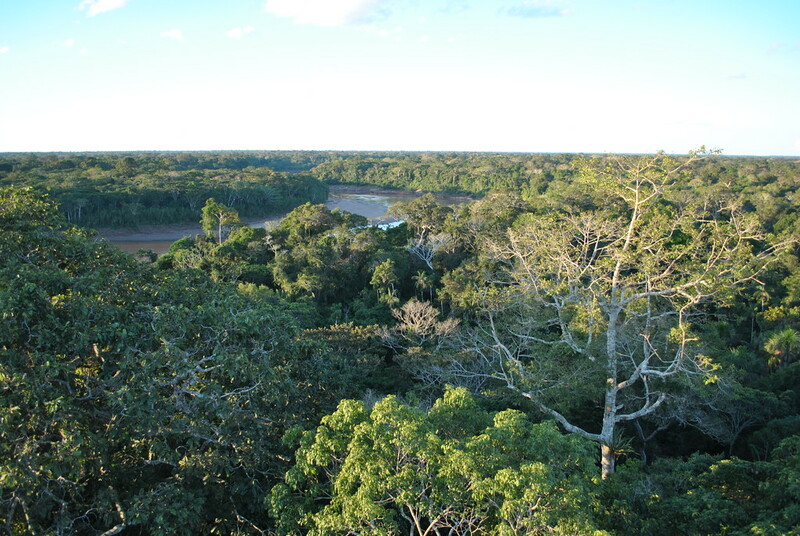 The Tambopata lodge is also a short walk from a canopy tower, which (once we reached the top) gave us unspoilt panoramic views of the Amazon jungle! 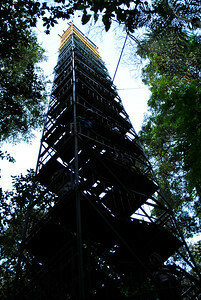 It’s not for the faint hearted though, and does sway a fair bit once you reach the top. And thats before you contend with all the flies and mosquitos biting you! On the second day, we visited a local tribe, learnt about their culture and how they dealt with ailments and pains in the jungle. My shaman experience was about to begin! The tribe grow a number of local herbs which we were able to sample. Some were to cure headaches, some for back pain. Not surprisingly, the only two I remember were the one which caused my mouth to go completely numb, and the herb that was apparently a natural substitute for Viagra! I made a mistake with the first herb, as we were supposed to take little of the leaf, place it in the side of our mouths and feel a small amount of numbness. I didn’t listen properly and put the whole thing in my mouth, and then chewed. Within about thirty seconds my entire mouth was numb and I couldn’t speak! What an error, Laura was happy though as it kept me quiet for a bit. With this experience fresh in my mind, when it came to tasting the natural Viagra, I was not going to make the same mistake! That would have been far more embarrassing, for very different reasons. 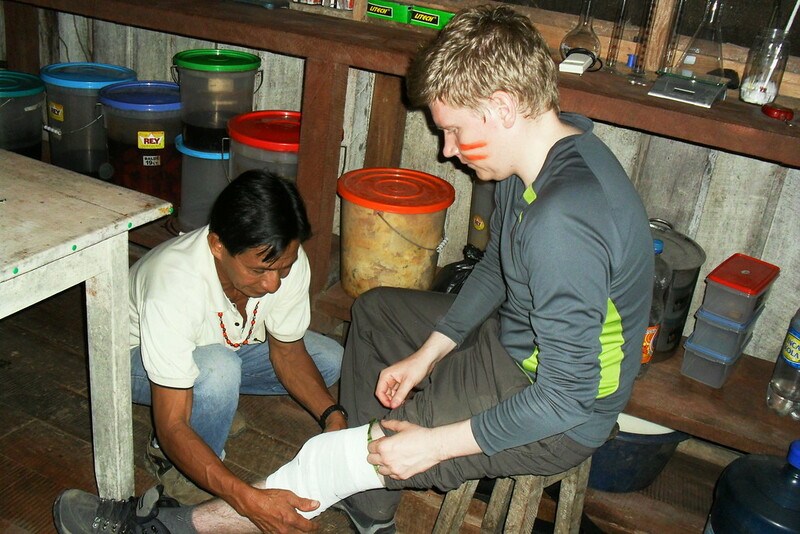 One of the guides explained to the shaman that I had hurt my knee, and asked if he could do anything for me. He kindly obliged, and began by holding his hands out around my knee and (I guess) sensing where the damage was and how to resolve it. After about thirty seconds, he suddenly grabbed my knee and started digging his thumbs into it quite strongly. At this point I was taken aback, was he going to do more damage than good? And then, after only 10 seconds or so he stopped, and left his thumb in the exact place where my knee was most painful. He took out a pen, dabbed a mark on it, and said he would fix it later. Once we had completed the tour of exotic herbs, and the feeling in my mouth had returned, I was taken to his hut/surgery for the next instalment of my treatment. This time it was little more normal to me, but only just. He began by whispering something that I couldn’t make out, and took out some oils he had from a jar on his shelf. After rubbing the oils in, he then took some leaves of some description and wrapped them around my knee. A bandage appeared to hold it all together. And I was cured! Well, apparently. I was to leave the dressing on for twenty four hours and then I would be cured. Magic. I too experienced this amazing Shaman… several years ago.. What a wonderful healer! we were the first tourists in this homestay I can’t wait to go back! Really Liz?! That’s amazing! He was a great guy, when do you plan to return?